Exceptional quality and printability set the Jerzees 996Y Youth 8 oz. 50/50 NuBlend® Pullover Hoodie ahead of other hooded sweatshirts. The pre-shrunk fleece retains its softness and sizing after being laundered, which also maintains the integrity of any printing or embroidery. High stitch density, combined with Jerzees NuBlend®, prevents little unwanted tufts of fabric from popping up after you wash the hoodie, keeping your design extra clear for a longer wear period, while quarter-turned fabric eliminates center crease. The thicker, two-ply hood protects your young one from weather exposure, but keeps him safe with the cordless pullover style. One big front pocket keeps hands warm and gives him a place to stash his stuff. These hoodies are a 50/50 poly/cotton blend, so you are getting the softness and temperature transferability of cotton, with the durable elasticity of polyester. This hoodie also complies with the tracking label requirements of the Consumer Product Safety Improvement Act. Jerzees has brand recognition at the top of the athletic apparel and t-shirt industry, getting their start in 1984 as a manufacturer of superior blank apparel. They took the basic, well-loved staples from the closet, and fine-tuned them into technologically advanced garments that have rendered themselves indispensable to businesses and the consumers who wear them. SpotShield, Dri-Power, HiDensi-T, and NuBlend are just a few of the unique patents Jerzees has developed to set their clothing above the rest. 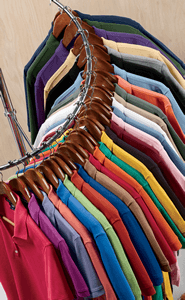 For example, the three strand blend of cotton, polyester, and rayon known as tri-blend has long since been the archetypal composition of high-end shirts. Jerzees wanted their tri-blend shirts to perform under a variety of situations. By rebalancing the formula into a 50/37/13 blend, they ensured optimal softness, durability, and value. They took this fabric and fused it with Dri-Power Technology, giving the shirt advanced moisture-wicking and odor blocking abilities, making it ideal for lounging and action alike. All four styles are classic fit and ready for garment decorating, and look great on men and women. From the basic Jerzees 601 series Adult 4.5 oz. Tri-Blend T-Shirts with crew and v-necks, to the 602 series Varsity Ringer Tri-Blend T-Shirts with a more sporty appeal, T-ShirtWholesaler.com has these blank Jerzees t-shirts ready to go. If you are looking for warmer pieces, Jerzees hoodies, sweatshirts and sweatpants literally have you covered. Modern open-bottom sweats and traditional 50/50 Super Sweats Pocketed Sweatpants can be worn in a variety of combinations to accommodate the weather and your intended activities. NuBlend Hoodies and other NuBlend polycotton items, which resist “pilling,” keep the surface smooth and newer-looking after washing. Shirts treated with SpotShield, such as the Men’s and Women's 50/50 SpotShield Polo Shirts, resist stains and repel water, keeping you cleaner and more confident throughout the day. Varying combinations of Jerzees blank apparel can be integrated to meet your daily demands and printing needs.